During this month the Trent Affair [see previous month] continues with much talk of war from both the U. S. and Britain. After intensive diplomatic negotiation, the U. S. releases Mason and Slidell at the end of December. Meanwhile Captain Charles Wilkes who had seized the diplomats has become a popular hero. Wilkes is already famous as the leader of the U. S. Exploring Expedition, 1838-1842 (see Sea of Glory, call #: 910.973 PHI), but this new fame gains him a promotion despite the diplomatic furor. Unfortunately, his inability to obey orders eventually leads to a court-martial and he loses his Navy command. Wilkes will survive both the war and his talent for trouble. After the war he moves to Gaston County for a few years where he owns the High Shoals Iron Works. 2 December. In Washington Secretary of War Simon Cameron reports on the status of the army: 20,334 Federal soldiers and 640,637 state volunteers. 8 December. John A. McMannen of Durham, North Carolina writes to William A. Graham. "There is much anxiety in this Country in regard to what action the Convention will take in reference to the Whiskey question. In regard to Taxing the Stills, etc. ... Will you believe me If I tell you there are eleven Still Houses within eleven Miles of this place, already Nearly Every Bushel of Corn is Bought Up that Can be Speared by the Corn Sellers, they have run it up to Near $4. per Bushel, and will go higher as the demand increases." His concern is shared by the government. While selling corn for whiskey is the best way for a farmer to make a profit on his crop, corn is also the mainstay of the diet of both humans and animals such as hogs and is needed at an affordable price by both the armies and the civilian population. A few months later an ordinance is passed prohibiting indefinitely the "manufacture of spiritous liquors from grains." 17 December. Among the participants in a skirmish in Kentucky is Confederate Lieutenant Harry T. Buford. The lieutenant's real name is Loretta Janeta Velazquez and by the end of the war she will have fought in Virginia and Kentucky including at Bull Run and Shiloh, commanded soldiers in battle, and been a spy. Toward the end of this month at Salem, North Carolina, Francis Raymond Holland sums up the year in the Moravian records. "In some respects the year 1861 has been a year unexampled in the experience of us all. ...The nature and extent of our national troubles have probably exceeded our worst anticipations. The present year has witnessed the commencement of a fearful and calamitous war between two different sections of our once united and prosperous country. When and how the dreadful strife will end is known only to God." Call Number: FIC ADA N.C. In tones as warm and rich as the sun shining on his Appalachian home, Larkin Stanton sings the country ballads of his heritage. Even before he could talk, Larkin would hum along with his Granny as she warbled. And though orphaned at birth, Larkin was never alone - born as he was into the clannish, protective Scottish community of the North Carolina mountains in the 1840s and placed under the care of his silver-tongued cousin Arty. As he grows, Larkin feeds on the subtleties of singing. When he goes head-to-head with his cousin Hackley, their ballad contests produce songs that bring a lump to the throat. And as the boys mature, their competition spreads to the wooing of Mary, the prettiest girl around. But shortly after Hackley wins her hand, he must fight in the Civil War. Left behind, Larkin finds himself inexorably drawn to the woman he has always loved. And what he does next will live on in the mournful ballads of his hills forever. The Civil War is raging and Mike Kelly, 12, who came to the Midwest on an orphan train, runs away from home with his friend Todd to join the Union Army. As musicians in the Second Kansas Infantry, they make a long and difficult march into Missouri, where they encounter General McCulloch's Missouri Guard at the arduous Battle of Wilson's Creek. Mike is wounded and left for dead; Todd is brutally killed. Mike looks on in agony while a man takes an heirloom pocket watch from his friend's body - he'd promised Todd he'd return it to his sister if anything ever happened to him. He is rescued by a Confederate soldier - someone he'd known on the orphan train - and eventually rejoins his regiment and has several adventures and close calls with Confederate sympathizers along the way. His overriding mission, however, is to retrieve Todd's watch. Nixon writes energetically and maintains an aura of adventure and danger. She clearly portrays the horrors of war, and the particular agony of this war. Her characters are finely drawn and multifaceted, the plot is lively, and the details are well chosen. Gr. 4-8. In researching his previous book, Chasing Icarus (2009), Mortimer encountered an obituary for a Union spy about whom no biography existed. Rectifying the omission, Mortimer recounts the tale of Pryce Lewis, a British immigrant who, in 1861, was an undercover operative for Allan Pinkerton and in turn employed by General George McClellan to obtain intelligence about rebel activity in western Virginia. Hatching a zany idea, Pinkerton had Lewis masquerade as an English aristocrat on tour. At least 250 women served - disguised as men - in the ranks of both North and South during the Civil War. Although works about female Civil War soldiers have appeared over the past several years, this volume, by National Archives archivist Blanton and Cook, a Fayetteville State University employee in North Carolina, makes a nice summation. After covering the major combat actions in which women served (and in which several were killed), the authors reconstruct the reasons why women entered the armed forces: many were simply patriotic, while others followed their husbands or lovers and yet others yearned to break free from the constraints that Victorian society had laid on them as women. Blanton and Cook detail women soldiers in combat, on the march, in camp and in the hospital, where many were discovered after getting sick. Some even wound up in grim prisons kept by both sides, while a few hid pregnancies and were only discovered after giving birth. Solid research by the authors, including a look at the careers of a few women soldiers after the war, makes this a compelling book that belongs in every Civil War library. Look elsewhere for the battles and heroes of the Civil War. This heavily illustrated volume concentrates on social rather than political history. Organized by chapters chronologically from "War Fever" to "Marching Home," the text discusses broad topics such as the troops' food, sickness, boredom, and letters home. The many reproductions of period photographs, documents, advertisements, and newspaper clippings bring the times into clearer focus. 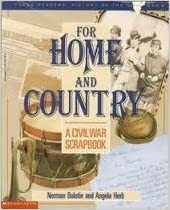 Giving a close-up view of everyday life for Civil War soldiers, this book fills in the blanks left by more traditional history books. Gr. 4-8.